Two layers of α-PbO2- and CeO2-doped β-PbO2 were anodically deposited on Ni foam substrate successively, and the prepared Ni/α-PbO2/CeO2-β-PbO2 electrode was used as a sensor to determine chemical oxygen demand (COD) by coulometric method. SEM and EDS disclose that the layers of α-PbO2 and β-PbO2 are compactly attached to the surface of the 3D structure substrate, and CeO2 is uniformly co-deposited with β-PbO2 onto the anode. 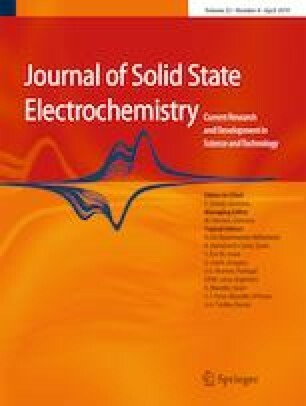 Results show that when the prepared Ni/α-PbO2/CeO2-β-PbO2 is used to oxidize the organic compounds at a constant potential of + 1.45 V (vs. Ag/AgCl) in aqueous solution, the anodic charge quantity is directly proportional to the amount of the organic compounds in the range of 15–1000 mg L−1, equivalent to the quantity of COD, no matter what species of the organic compounds is detected. This means that the universal coulometric method is only decided by the total amount of COD but unrelated to the species of COD. It takes only 10~20 min to detect one sample by the well-designed electrode–cell system in this study due to the high generation rate of ·OH on β-PbO2, good electrical conductivity of CeO2-doped PbO2 layer, and the great ratio of area-to-volume (S/V) through elaborative cell–electrode system design. These properties enable the Ni/α-PbO2/CeO2-β-PbO2 electrode to be a promising sensor for coulometric determination of COD in industrial application. 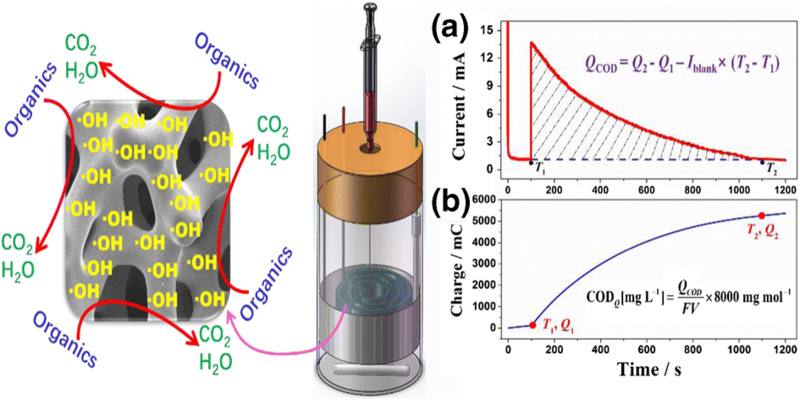 A composite 3-D Ni/α-PbO2/CeO2-β-PbO2 electrode with high stability, high electrocatalytic activity, and large specific surface area was developed for determination of chemical oxygen demand values in wastewater. An improvement of S/V ratio was realized through special design of the electrolysis cell and electrode system. Potentiostatic oxidation method was adopted to conduct coulometric determination by using Ni/α-PbO2/CeO2-β-PbO2 as working electrode. The time for this coulometric determination carried out at room temperature is 6–12 times shorter than that for the standard dichromate method which involves harsh condition of the digestion process. After comparing the results of the coulometry method with those of the standard dichromate method, it is proved that the coulometry test is accurate, feasible and reliable, and suitable for real sample COD detection in industries. The online version of this article ( https://doi.org/10.1007/s10008-019-04250-4) contains supplementary material, which is available to authorized users. The authors greatly appreciate the support from the National Natural Science Foundation of China (No. 21506010), the Beijing Municipal Natural Science Foundation (2182050 & 2182046), and the Fundamental Research Funds for the Central Universities of China (No. JD1812, No. JD1923). This work is supported by the Beijing Key Laboratory of Environmentally Harmful Chemical Analysis. The authors especially thank Prof. Xiaoguang Liu for the important discussions and suggestions of this work.